2 pounds shelled uncooked shrimp. 3 TBLS of fresh basil. 1 1/4 cup of olive oil. 2 TBLS of lemon juice. 2 TBLS of fresh parsley. 2 TBLS of white wine. 1 TBLS of fresh oregeno. For shrimp and marinade: Finely chop 3 cloves of garlic, 2 TBLS of fresh pareley and 1 TBLS of fresh oregeno and place in a bowl. Add in 3/4 cup of olive oil, lemon juice, salt, pepper, white wine. Let marinade for three hours. Grill on low medium heat. Sauce: chop roma tomatoes, 3 cloves garlic and basil. Place chopped tomatoes, garlic and basil in a sauce pan. Add 1/2 cup of oilive oil. Cook for 5 minutes while stirring. 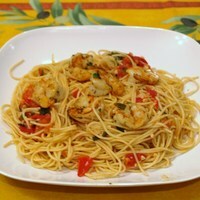 Combine: place sauce on cooked angel hair and then add grilled shrimp. Simple, tasty recipe. We cooked with Barilla Plus angel hair pasta, which is healthy and tasty! The grilled shrimp are yummy by themselves. Cook some extra for an appetizer or for the next night's meal. They carry over well and would be good served cold on a salad. I added extra salt and pepper to give it a little more flavor. Light and yummy. Our kids ate it two nights in a row! We loved this dish - it was packed with alot of flavor. It doesn't seem too hard to prepare and so much better than a can of tomato sauce! I can't wait to cook this. It sounds delicious. Sounds fantastic, my mouth is already watering at how tasty this will be tonight!! Made this for dinner tonight. My husband who is usually not a spaghetti lover even had 2 helpings! Thanks for sharing this wonderful recipie. I love the colors in this dish. What a great way to use shrimp, and how can you miss with basil? Excellent! Will cook again and again. Thanks for a great recipe. Another pasta recipe for me to try... i like! Im putting this on my to do list too.................. Got to try! Looks delicious. I would love that for lunch. This looks really good. I'm going to give it a try tonight. Looks awesome. This is going on the menu in our house sometime in the next two weeks for sure! Keep tuned for a review.